With Weiser® you can blend simplicity with elegance. Whether you're looking for traditional, transitional or contemporary style, our selection and finishes will make it easy to find the right accent for your home. With a touch of the coast, Avalon's sweeping curves provide a heightened sense of style. Handleset can be locked or unlocked by a key from the outside or with a key/turnpiece from the inside. The crisp, clean appearance of the Satin Nickel finish adds to the overall look of the product and brings a modern feel. 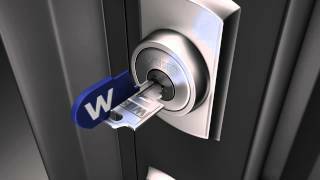 Featuring SmartKey® re-key technology; re-key the lock yourself in seconds in 3 easy steps. Locking mechanism functions with turn piece on the interior of the lock. Easily installs in minutes with just a screwdriver. Latch Backset Size Adjustable 2-3/8" or 2-3/4"